The local restaurant scene continues to be on a tear. In this issue, F&D is listing 30 restaurants that have opened in the last three months (or are scheduled to open by the fall) – 23 new concepts and seven new locations for businesses that have decided now is the time to open additional outlets. That number lopsidedly contrasts with only 14 restaurants that have closed their doors – eight of which were stand-alone businesses, the others multi-location businesses that have shuttered one of their outlets. How long such continued growth can be sustained is anyone’s guess. But, for the moment, there are more choices than ever for your dining dollars. Two very familiar names on the local scene have opened new businesses, both taking tacks different from their previous courses. Fernando Martinez and his Olé Restaurant Group continue to demand attention, this time with their transformation of the longtime Joe’s Older Than Dirt property in Lyndon into Red Barn Kitchen, a not-your-usual barbecue and fried chicken spot at 8131 New La Grange Rd. with Chef Reed Johnson at the helm in the kitchen. Kevin Grangier, who didn’t take long to recover his energies after opening the over-the-top Le Moo, has returned to his Anchorage base by opening Kevin’s PICNIC, a casual eat-in and take-out restaurant at 11505 Park Rd., near his flagship Village Anchor Pub. Some other familiar faces have also started new ventures. Darnell Ferguson’s new Highlands iteration of SuperChefs shows he pretty much has earned that soubriquet, and Bobby Hancock and his wife, Kit Garrett, co-owners of Blue Dog Bakery and Café, are finally ready to open their long-awaited butcher shop and café, Red Hog. Ferguson, who had made a name for himself at a series of pop-up breakfast spots, had been in his first stand alone restaurant in St. Matthews for less than a year before a fire burned out the business. His big personality (and his super-sized dishes named after comic superheroes) earned him some national attention and support, which has enabled him to re-open SuperChefs at 1702 Bardstown Rd., in the little restaurant row that also harbors Tom+Chee and Sapporo. He and his staff change the interior decor from celebrating superheroes during the day to recognizing their super-villain foes at DINNER, the evening identity of his restaurant. Hancock has been busy raising heritage hogs and studying the fine art of sausage-making and charcuterie for several years, and has been renovating a Crescent Hill service station at 2622 Frankfort Ave. for about a year. He is now ready to open Red Hog in late August as a café/salumeria/butcher shop, where he will serve sandwiches, sausages and other preserved meat dishes to eat in or on the patio, and sell his own pork, and beef and lamb raised by other local farmers. One other veteran of the local scene is back with a new restaurant. Matt Davis, whose Lil Cheezers concept had its ups and downs, has renovated a corner space in Old Louisville at 1161 S. Second St. for his Slice, a high-concept deli that has hit the ground running. Seven new restaurants are serving ethnic food of one kind or another, but one of them, Pho Ba Luu, situated in a sharply remodeled truck garage at 1019 E. Main St., takes a modern fast-casual approach to serving Vietnamese street food. Order pho or banh mi sandwiches at the counter to take away, or sit inside or out on the secluded rear patio. They are set for a late August opening. In Clifton Time 4 Thai has moved into and renovated the space at 2206 Frankfort Ave. that has seen several short-lived restaurants come and go. The decor changes make the room crisp, modern and just exotic enough, and the new owners bring a range of restaurant experience that has made a strong positive early impression. Some other new restaurants serving Asian food have set up shop far and wide. Legend of China is being run below the owners’ living quarters at 9415 Norton Commons Blvd. The Shanghai-style street food menu is limited for now, and take-out only. And Chinese Chef has opened at 7813 Beulah Church Rd. An Indian restaurant, Bawerchi, at 1613 Bardstown Rd. (formerly Aladdin’s Café) serves vegetarian and halal meat dishes from all over the subcontinent. Carali’s Rotisserie Chicken cooks up Peruvian-style chicken, a rendition that is building a loyal fan base. Carali’s is at 9148 Taylorsville Rd. And Pasha’s Mediterranean has been serving hummus, falafel and baba ganoush – and hookahs – at 3904 Bardstown Rd. for a while now, but is just now coming to our attention. Two new coffee houses have opened in the area. Hobknobb Coffee Co. is a growing local concern across the river. Their second store is at 420 Spring St., Jeffersonville. Germantown has seen a lot of new food and drink establishments in the last few years, but Bean is the first dedicated coffee bar since Sunergos opened a decade ago. Bean has opened in a renovated building at 1138 Goss Ave., at the corner of Texas Ave., where, across the street, the guys behind The Silver Dollar have opened The Pearl at 1151 Goss Ave. This neighborhood bar has an old-school vibe with pickled eggs and other VFW-style snacks at the bar, but the owners plan to develop their own food truck serving house-made sausages and hot dogs on the back patio. Back in the Highlands, the restaurant space at 962 Baxter Ave. that most recently was America. The Diner. is now the 21st restaurant in the El Nopal family of Mexican eateries. A few chains that originated elsewhere have found Louisville to be fertile ground for growth. 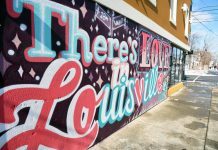 The most notable is HopCat, a Michigan-based craft beer restaurant that has invested considerable time and money in renovating a commercial building at 1064 Bardstown Rd., just off the Grinstead corner. They opened at the end of last month, boasting the most craft beer taps in town (over 130, including 30-plus locally made brews), an impressive whiskey list numbering over 200 and a house-made menu of pub grub that is a cut above. Across the river, at 4631 Medical Plaza Way, Clarksville, Bubba’s 33, a family-oriented sports bar, has opened. And the two new pizza joints in town, MOD Pizza at 3085 Breckenridge Ln. in Hikes Point and Topp’t Pizza & Chopped Salad at 373 Professional Ct. in New Albany, are chain operations, though calling Topp’t a chain probably is stretching it a bit; the Elizabethtown business is opening just its second outlet in New Albany. The space at 2009 Highland Ave. that has seen several different concepts floating through in the last year or two is now NOLAFARE, which proudly offers vegetarian, vegan and allergy-sensitive choices – sandwiches, wraps, soups, desserts and so on. Wild Dog Rose Tea Boutique at 1570 Bardstown Rd. also caters to a special audience with a range of teas, tisanes and infusions, along with a variety of so-called New Age accouterments. King Donuts opened in May at 608 Lyndon Ln. The owners of Goose Creek Diner are opening Gander, An American Grill at 111 S. English Station Rd. in late August. And fans of the old Baxter Station have been watching the renovations underway on that building at 1201 Payne St. for a while now. That space is opening in August as Ciao, an Italian restaurant, with the kitchen under the supervision of Luigi Gelsomini, who operates Luigi’s Pizza on Main St. downtown. Several businesses have felt well-enough established to open additional outlets in recent months. The popular Highlands small plates wine bar LouVino has opened a suburban location in Middletown at 11400 Main St. The long-established Highlands breakfast and brunch place, Highland Morning, has opened a second location in St. Matthews, in the building that recently housed a Tom+Chee store at 111 St. Matthews Ave.
Joy Luck, the Taiwanese Chinese place in the Highlands, has expanded into the suburbs, too, joining a growing restaurant cluster at 9850 Von Allmen Ct. A longer-established pan-Asian fast-casual restaurant, Yang Kee Noodle, has opened its third store, remodeling the short-lived KFC Eleven building at 1004 Bardstown Rd. Sicilian Pizza & Pasta, which has built a solid lunch business downtown on Fourth Street, has opened a second at 8133 Bardstown Rd. First Watch, a chain that has large ambitions in Louisville, has opened its second breakfast and lunch spot at 960 Breckenridge Ln. And one restaurant is on the move. Aladdin’s Cafe is going to become Aladdin’s Mediterranean & Middle Eastern Cuisine when it moves into the new Underground Station retail development in downtown New Albany at 37 Bank St. in August. Only 14 restaurants have closed in the previous quarter of the year, the fewest in recent memory. Perhaps the one that will most be missed is Joe’s OK Bayou at 9874 Linn Station Rd. One of only five restaurants in the listings serving Creole/Cajun cooking, Joe’s had been around for quite a few years at different locations in Louisville and in Southern Indiana. Sam’s at the Montrose, 318 W. Lewis and Clark Pkwy in Clarksville, has closed because they found buyers who made an attractive offer. The new owners, Rails Craft Brew & Eatery, opened quietly the last week in July after renovations were completed. The owners of El Camino, which had established itself solidly in the space that previously had been Avalon, at 1314 Bardstown Rd., with a comfortable three-season patio, surfing and luchador movies inside, and tasty “Mexican street food,” have decided that their concept would work better in a smaller space, and are looking to relocate in the near future, scaling down to half the current 300 seat capacity. The Cincinnati chicken-themed restaurant The Eagle liked the El Camino location, and El Camino’s owners found it amenable to sell the space and look to relocate elsewhere in town. Four other smaller restaurants have also closed recently: Aladdin’s Café at 1613 Bardstown Rd. gave way to the newly opened Bawerchi, Chop Shop Salads at 126 Breckenridge Ln., Chinese Chef at 2619 S. Fourth St. and Eastern House at 5372 Dixie Hwy. The latter seems to be undergoing remodeling; we wait to see how new owners transform it. Five restaurants working multiple locations have closed one store. Both the Prospect Bristol Bar & Grille at 6051 Timber Ridge Dr. and the Highlands location of Café Lou Lou at 2216 Dundee Rd. could not satisfactorily renegotiate their leases, and have closed those stores, but are still operating at other locations. Sapporo has closed its handsomely designed Theater Square restaurant at 649 S. Fourth St., but its original location on Bardstown Rd. is still open. The Homemade Ice Cream and Pie Kitchen in Clifton at 2232 Frankfort Ave. has closed; the business has announced that it hopes to open an outlet on Dixie Hwy., but no specifics on that yet. And the Tom+Chee soup and sandwich shop at 111 St. Matthews Ave. has closed.